After my email yesterday and declaration of not watching the Super Bowl, I did tune in a couple of times. Fortunately one of those times was the last 57 seconds of the game. The time before that was right before half time when Atlanta had the game. Needless to say, I was floored to see that New England had tied things up and then went on to win the game. At the risk of a cheesy sports analogy (especially coming from someone who isn’t a huge sports fan), if that isn’t a testament to not throwing in the towel, giving up or counting someone out…. I don’t know what is. Even though I’m not a huge sports fan, I do love sports movies… Rudy is one of my all time favorite sports movies (great soundtrack too… all instrumental). I even watched ‘Bleed for This’ with Miles Teller this weekend. The real-life story of boxer Vinny Pazienza, who after winning a title fight gets into a head-on collision (it was 1988, no seat belt laws then), breaks his neck and chooses to wear a halo for six months (instead of letting the doctor fuse his neck). So he can box again. And he does… he comes back and goes on to have a great boxing career. Even when everyone thought he’d never box again. You can’t watch stories like that and not take a look at your life and convictions. Would you have the strength and conviction to go against all the odds and do what you knew in your heart… in your gut… was what you were supposed to do? I’m sure many of you probably feel that with your businesses. Whether you’ve been doing it a year or 10. There are times when we all question what the bucket we’re doing and consider throwing in the towel. But then you get up the next day, you get an email, you see something that inspires you, and you remind yourself that you’d rather go all in. Do what you know lights you up and sets your heart on fire. Once you’ve had a glimpse of the quality of life you want (freedom, not working for anyone else, doing work you love, and connecting with people all over the world), you know you can’t go back. One of my favorite sayings is “you can’t un-push a button”. We all get sidetracked, take a different road at times, but inevitably we come back to what we know in our gut is right for us. Which is why I’m getting back into webinars. I’ve taken my fair share of ‘how to run a successful’ webinar courses and even spent a boatload of money on a mentor (so not worth it), but in the end, my webinars are better when I do what feels right to me. There is one little spin I’m going to test with this first one. Which, by the way, is simply a training webinar. I’ve connected with a fabulous woman named Coleen Stanley who has a framework for ‘Flipping Your Webinar”. I’m going to test it out (you’ll hear more about that after I’ve gone through the process). In the meantime, you can register for my first foray back into the webinar space below. 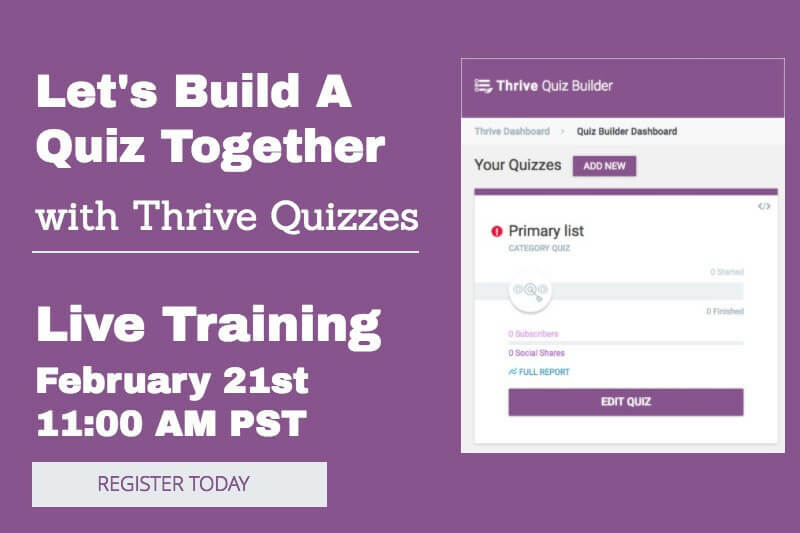 If you haven’t heard about it, Thrive has come out with a Quiz Builder plugin. I’ve tried my fair share of quiz builders but never really fell in love with any of them. Because I’m a huge fan of Thrive products, I thought it was a perfect time to dive in and test the process. So we’re going to build a quiz together. Here’s the catch… I’m going to need a little bit of help from you before the webinar. Don’t worry; it will be quick & easy. I’ll be reaching out to ask you a few questions. I want to cater the webinar to your questions, concerns, and challenges. You’ll also get a glimpse of my new webinar platform that I am LOVING… demio! The webinar is on Tuesday, the 21st. There will be a replay, but I promise you’ll get WAY more out of it if you attend live.